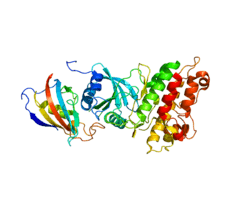 Activin A receptor, type I (ACVR1) is a protein which in humans is encoded by the ACVR1 gene; also known as ALK-2 (activin receptor-like kinase-2). ACVR1 has been linked to the 2q23-24 region of the genome. This protein is important in the bone morphogenic protein (BMP) pathway which is responsible for the development and repair of the skeletal system. While knock-out models with this gene are in progress, the ACVR1 gene has been connected to Fibrodysplasia Ossificans Progressiva, a disease characterized by the formation of heterotopic bone throughout the body. Activins are dimeric growth and differentiation factors which belong to the transforming growth factor-beta (TGF beta) superfamily of structurally related signaling proteins. Activins signal through a heteromeric complex of receptor serine kinases which include at least two type I ( I and IB) and two type II (II and IIB) receptors. These receptors are all transmembrane proteins, composed of a ligand-binding extracellular domain with cysteine-rich region, a transmembrane domain, and a cytoplasmic domain with predicted serine/threonine specificity. Type I receptors are essential for signaling; and type II receptors are required for binding ligands and for expression of type I receptors. Type I and II receptors form a stable complex after ligand binding, resulting in phosphorylation of type I receptors by type II receptors. This gene encodes activin A type I receptor which signals a particular transcriptional response in concert with activin type II receptors. ACVR1 transduces signals of BMPs. BMPs bind either ACVR2A/ACVR2B or a BMPR2 and then form a complex with ACVR1. These go on to recruit the R-SMADs SMAD1, SMAD2, SMAD3 or SMAD6. A mutation in the gene ACVR1 (= ALK2) is responsible for the fibrodysplasia ossificans progressiva. ACVR1 encodes activin receptor type-1, a BMP type-1 receptor. The mutation causes the ACVR1 protein to have the amino acid histidine substituted for the amino acid arginine at position 206. This causes the protein ALK2 to change in the critical glycine-serine activation domain of the protein which will cause the protein to bind its inhibitory ligand (FKBP12) less tightly, and activate its SMAD pathway specific proteins more effectively than usual. The result is the BMP pathway will trigger when it should not, and bone will form in soft tissues throughout the body. This causes endothelial cells to transform to mesenchymal stem cells and then to bone. Mutations in the ACVR1 gene have also been linked to cancer, especially diffuse intrinsic pontine glioma (DIPG). ↑ ten Dijke P, Ichijo H, Franzén P, Schulz P, Saras J, Toyoshima H, Heldin CH, Miyazono K (October 1993). "Activin receptor-like kinases: a novel subclass of cell-surface receptors with predicted serine/threonine kinase activity". Oncogene. 8 (10): 2879–87. PMID 8397373. 1 2 3 Pignolo, Robert J. (June 2013). "Fibrodysplasia Ossificans Progressiva: Diagnosis, Management, and Therapeutic Horizons". Pediatr Endocrinol Rev. ↑ "Entrez Gene: ACVR1 (activin A receptor, type I)". ↑ Inman GJ, Nicolás FJ, Callahan JF, Harling JD, Gaster LM, Reith AD, Laping NJ, Hill CS (July 2002). "SB-431542 is a potent and specific inhibitor of transforming growth factor-beta superfamily type I activin receptor-like kinase (ALK) receptors ALK4, ALK5, and ALK7". Molecular Pharmacology. 62 (1): 65–74. doi:10.1124/mol.62.1.65. PMID 12065756. ↑ Shore EM, Xu M, Feldman GJ, Fenstermacher DA, Cho TJ, Choi IH, Connor JM, Delai P, Glaser DL, LeMerrer M, Morhart R, Rogers JG, Smith R, Triffitt JT, Urtizberea JA, Zasloff M, Brown MA, Kaplan FS (May 2006). "A recurrent mutation in the BMP type I receptor ACVR1 causes inherited and sporadic fibrodysplasia ossificans progressiva". Nature Genetics. 38 (5): 525–7. doi:10.1038/ng1783. PMID 16642017. ↑ van Dinther M, Visser N, de Gorter DJ, Doorn J, Goumans MJ, de Boer J, ten Dijke P (June 2010). "ALK2 R206H mutation linked to fibrodysplasia ossificans progressiva confers constitutive activity to the BMP type I receptor and sensitizes mesenchymal cells to BMP-induced osteoblast differentiation and bone formation". Journal of Bone and Mineral Research. 25 (6): 1208–15. doi:10.1359/jbmr.091110. PMID 19929436. ↑ Taylor KR, Mackay A, Truffaux N, Butterfield YS, Morozova O, Philippe C, Castel D, Grasso CS, Vinci M, Carvalho D, Carcaboso AM, de Torres C, Cruz O, Mora J, Entz-Werle N, Ingram WJ, Monje M, Hargrave D, Bullock AN, Puget S, Yip S, Jones C, Grill J (May 2014). "Recurrent activating ACVR1 mutations in diffuse intrinsic pontine glioma". Nature Genetics. 46 (5): 457–61. doi:10.1038/ng.2925. PMC 4018681 . PMID 24705252. ↑ "Cure Brain Cancer - News - Multiple Breakthroughs in Childhood Brain Cancer DIPG". Cure Brain Cancer Foundation. ↑ Buczkowicz P, Hoeman C, Rakopoulos P, Pajovic S, Letourneau L, Dzamba M, et al. (May 2014). "Genomic analysis of diffuse intrinsic pontine gliomas identifies three molecular subgroups and recurrent activating ACVR1 mutations". Nature Genetics. 46 (5): 451–6. doi:10.1038/ng.2936. PMC 3997489 . PMID 24705254. Human ACVR1 genome location and ACVR1 gene details page in the UCSC Genome Browser.